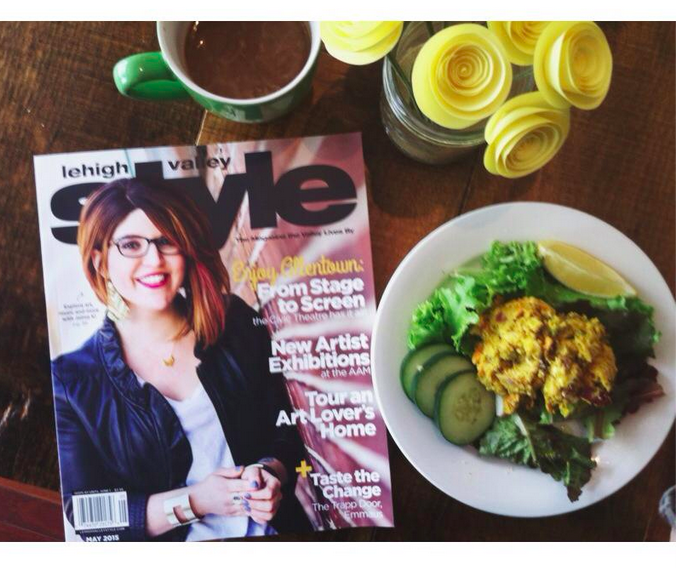 vegetarian lehigh valley | Save the Kales! Save the Kales TV: One Year Passed… and a BIG ANNOUNCEMENT! Last week we taped the cooking segments of our thirteenth episode, the first episode of the second year for the Save the Kales! TV show. It has been so hard to keep this a secret! I’ll give more info as everything unfolds, but if you live there or have any friends in Seattle, put in a good word for us, will you? I’m excited about it airing in Canada since I already sort of have the accent, eh? Our show, the Little Show That Could, has come a long way in the first year. I’ve had some chuckles with the crew about that first episode (parts of it cringe-worthy), the way creating each DIY episode completely on our own has been such a wonderful lesson in getting more comfortable talking on camera, slowing down, tightening the editing, bringing in more cameras, utilizing help of assistants and interns… and I’ve made some very, very good friends. 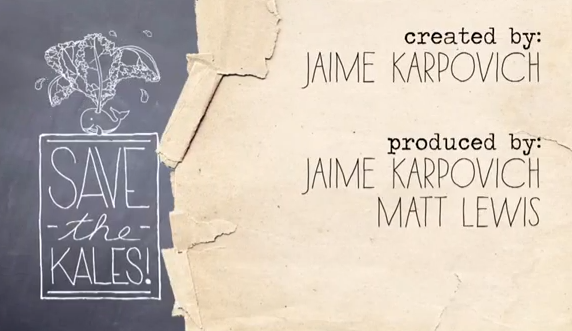 There’s his name in the credits! Yay, Matt! Matt is my right-hand-man, and without his help the show would not exist. He’s a co-producer, the main camera man, the director, and editor. It’s a shame you don’t get to see him in every episode because he puts a tremendous amount of time and work into every single one. “This past Wednesday I was reflecting on the fact that the STK! show was a year old. I was thinking of how the quality keeps getting better, how it seems to be growing in popularity and all the positive things that have come out of it. Then I realized something that came out of the show I hadn’t considered…it’s been slowly changing me too. Obviously, since my daughter came along eight months ago, my whole role in life has been re-evaluated, re-organized and restructured. All though it has all been wonderful it hasn’t always been easy. Somehow, Save the Kales! 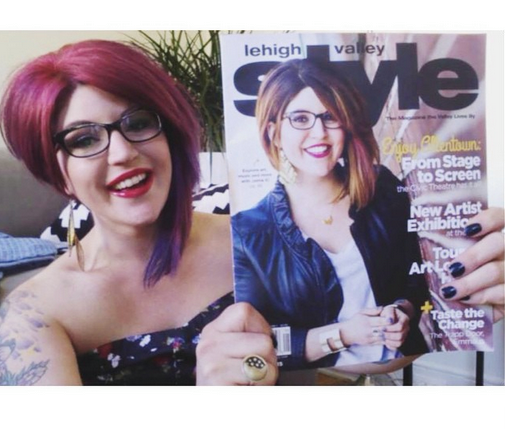 became this goal…something positive, something that I felt needed to get out to the world…something that would make people more empowered about themselves and happy about who they are (or in my case, happy about who I was becoming). I know life isn’t always easy and we still have a ways to go with the show, but you should be very proud of yourself…you can and ARE changing peoples lives for the better. There is far too little good in the world that gets exposed and I feel it is our mission to get more good out there to the public. With that all being said…thank you, thank you, thank you. I’m glad there are people like you in the world and I’m very excited that we’re working with you to make it better. 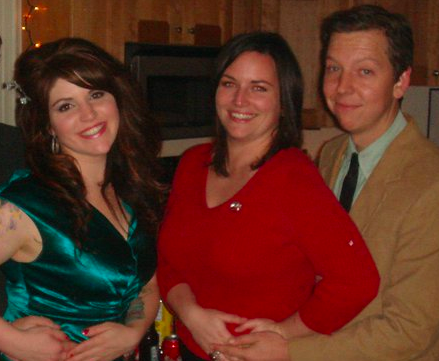 Me, Sarah and Matt three Christmases ago because I can’t find a more recent photo of the three of us together (!). THEY MAKE DREAMS HAPPEN. And it’s true. We make this show because we believe in it. Listen, if I was a painter, I’d paint. If I was a musician, I’d make music. Or draw, or sculpt, or create whatever it is my abilities lent themselves to in order to do the work that expresses our mission: be kind to yourself, animals, and each other. …As it is, we have equipment and an outlet to make a show on TV and we do our best to make it welcoming and informative while being friendly and inclusive. We make a show because that’s what we can do. We recently got a new sponsor who reached out to us because “the show isn’t pretentious, and [they] like that”. What a compliment! 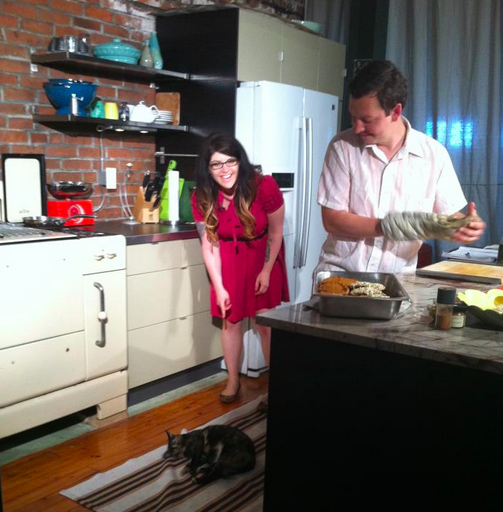 On the set of our third episode, performing the ritual of clearing kitties out of the kitchen. Thank you for watching or reading or supporting Save the Kales! in your own way, and supporting what we stand for. Matt said, “There is far too little good in the world that gets exposed, and I feel it is our mission to get more good out there to the public.” Yes, yes, a thousand times YES. … and this outtake video of our second episode, because it makes me laugh every time I see it, and who couldn’t use a good, contagious laugh? The past several weeks have been the longest I’ve gone without blogging since the birth of this site. Now, the month of it’s third Birthday, I find myself in a new home with a new four-legged family member. The moving process always feels so vulnerable. Your hands touch every. single. thing. you own, and that moment determining it’s value can feel equally oppressive and insignificant. The best parts have been purging so much to make room for only what I really love and what supports my ideas of beauty and inspiration (I can’t even remember what I’ve gotten rid of), the paint samples and furniture arranging and lazy nights giddy to just stare at the walls and all the other joys of nesting, and uncovering so many beautiful things I forgot meant something to me once. and pride is, after all, what we have. And the Universe knows this is not the whole truth. It knows it like it knows we can’t pray a lie. I love you because of all we have been through together. And the Universe does not like this cliche any better. Do you not manifest “all that you have been through together”? The Universe knows and will not let me get away with half a truth. because we have put each other through “all that”. The knowledge that the final solution does not involve Bean-o. But the Universe will not allow this equivocation either. In the face of this sorrow, why do I continue to love you? It is not because daughters are better than husbands. It comes about without cause. 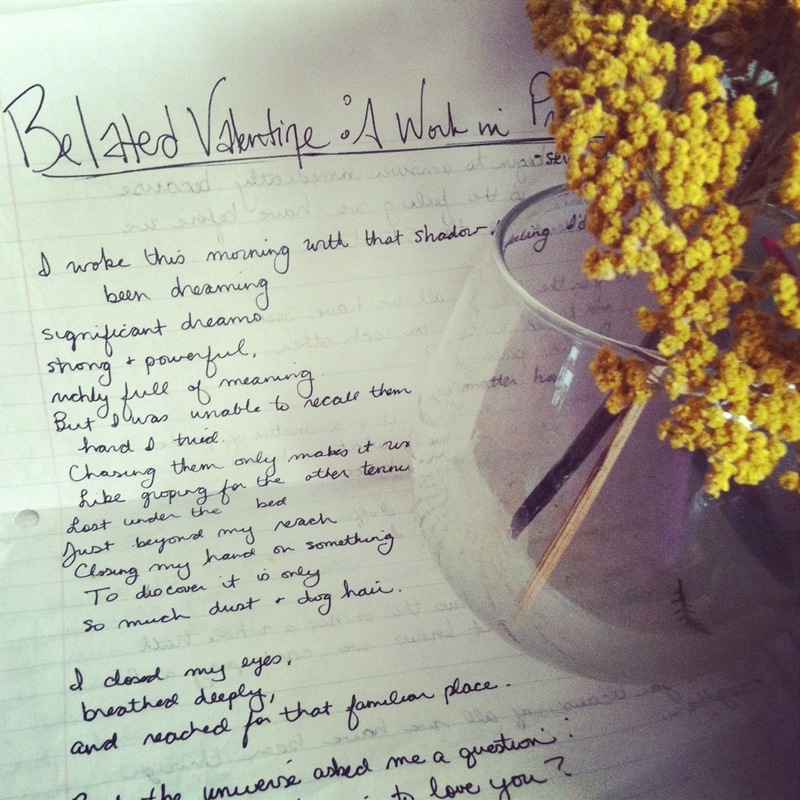 That is why love fits more aptly into poetry than paint. It comes to the heart, through the nose and the fingertips. I will take one more goddamned pitch! And inside those parenthesis is one word. … Whether you’re in romantic love or in love with life or in love with your own heart, recognize how very special that is. Love is hard work (worth it). It’s there every moment, a small vibrational hum, the ambient sound of day-to-day life: we notice it when it’s gone. Don’t take it for granted. Bethlehem Vegfest 2012 is Almost Here! 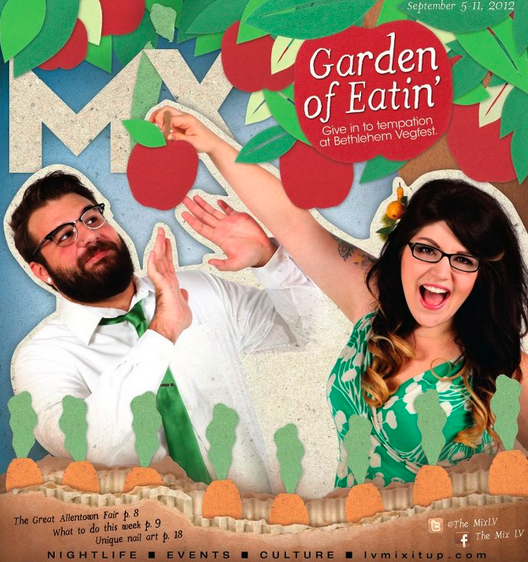 Pick up your free copy of The Mix this week for the special Bethlehem Vegfest feature! Save the Kales! promotes veganism as an ethical, compassionate lifestyle and any and all suggestions made by me to be part of Vegfest as speakers or vendors are committed to this, too. I was going to make a “Must See” list, but I think you guys can handle it. There will be plenty to see, listen to, watch and eat. Bring your family, bring your dogs. You can find the lineup of speakers and cooking demos HERE, and a list of every vendor HERE. IN THE MEANTIME… Don’t miss the last few days of Vegfest Restaurant Week! 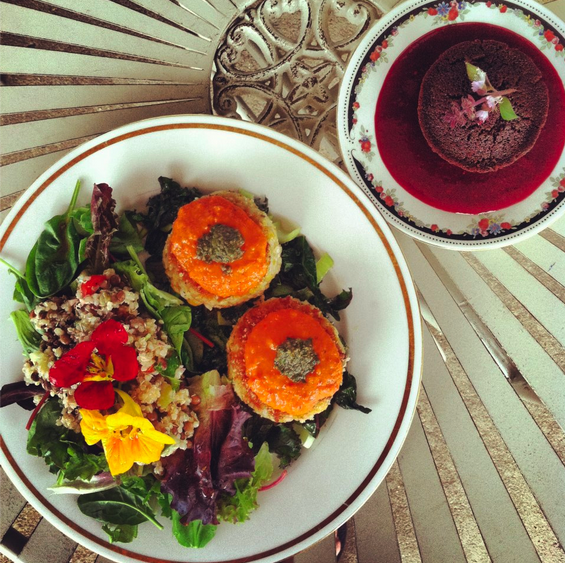 This gorgeous meal comes from Cafe Santosha, one of the most veg-friendly eateries in the ENTIRE Valley. The food always looks like art, and tastes like it too. Healthful and creative dishes are always on the menu. Check out their facebook page for photos and updates. other special vegan items in the LV this week at Jumbar’s, Tapas on Main, Yianni’s Taverna, Molly’s Irish Grille, and Sotto Santi Pizza is making vegan pizza all week! You can find the WHOLE list of participating restaurants and their menus HERE, 13 in total. Happily, many of these places offer some/all of the selections year-round.